Your Chihuahua puppy needs as much love and attention from you as he can possibly get. This means he will always want to be with you, despite where you may go. 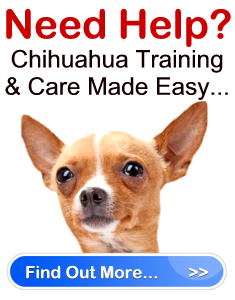 You can grant your Chihuahua dog with his wish with the right pet carrier. What is a pet carrier? Essentially it is a moderate sized “purse” that comfortably holds your dog, allowing you to take him with you wherever you go. If you are interested in obtaining a pet carrier you will discover that there are tons to choose from. For instance, you can purchase a pink or blue carrier, a plaid carrier, leopard print carrier, or a leather carrier. You can choose a carrier that lets your dog poke his head out, or a carrier that conceals the dog completely. Pet carriers can range anywhere from $30 to $1000. Thus, as you can see, there is bound to be one that suits both your taste and budget. When you shop for a carrier for your Chihuahua puppy, the most important aspect you need to keep in mind is the functionality of the carrier. Functionality should be more important than style. After all, your dog’s comfort is what matters most. Make sure the carrier has a strong bottom so your dog will feel secure as you travel. Make sure there are no hard pieces of plastic, zippers, etc. that are protruding and could injure your Chi. Find a carrier that has a removable pad on the bottom so you can wash it. Make sure the straps are sturdy and securely attached to the bag. The last thing you want, are for the straps to give out when you are carrying your dog. Put a treat in the bag in front of your puppy and encourage him to jump in and get it. Try this a few times on different occasions. Once your dog becomes familiar with jumping into the bag for a treat, put him in the bag and feed him a treat while he’s in there. Make a big fuss over him once he’s insides the bag to let him know that you are really pleased with his behavior. Every time you place your Chihuahua puppy in the carrier, use a single special word so he will eventually associate this word with the bag and then a treat. Once he’s in the bag give him a treat. Once your dog becomes used to the carrier, begin to pick up the bag with him in it and go about the house. Talk to your dog the whole time to keep him relaxed in the bag. Once you feel your dog is comfortable with traveling in the bag, start taking him out with you for short trips. Eventually, your Chihuahua puppy will enjoy his pet carrier and associate it with spending time with you while you travel.